Synopsis: When 5 year old Bo and his 12 year old brother Prosper are orphaned, they run away to the magical city of Venice. They are fleeing from their aunt and uncle who are keen to adopt the angelic looking Bo but not his less adorable brother. Determined not to be separated, the two boys would rather risk a life of homelessness than for Bo to be snatched away by the glamorous but heartless Esther Hartlieb. In the maze-like alleys and romantic Veneitan squares, Prosper and Bo meet a group of homeless children who take them under their wing. Living in a disused cinema, the motley crew have a simple but content life. Their food and material needs are cared for by the mysterious Thief Lord. A boy of only 12, the Thief Lord is idolised by the children for his constant supply of stolen goods as well as shadowy, unknown nature. Whilst Bo and Prosper settle into their new life, their aunt and uncle are determined to find Bo and take him home with them. Arriving in Venice, they hire the services of private detective Victor Getz. Thus begins the canny and comical pursuit of the two boys. To everyone’s surprise however, the hunt leads to a chain of events that no one imagined possible. My thoughts: In my previous review, I raved about the qualities of classic children’s books written in the last century. My desire to read more dated literature came after reading a number of modern books which hadn’t gripped me or inspired me (I haven’t reviewed those books – I only post reviews of books I think are worth reading!). However, I picked up The Thief Lord with hopeful expectations because I am a big fan of Cornelian Funke’s writing. And yes, it lived up to and exceeded my expectations as well as restoring my faith in modern children’s books. I loved the child-centred plot of this book. Bo, Prosper and their friends are the key characters and Funke depicts their friendships and day to day life in a convincing and engaging manner. She accurately captures the carefree nature of children, their resourcefulness, their idealistic dreams but also their vulnerability. Funke has also created a colourful array of characters which kept my attention throughout. Some characters at first seem to fit into recognisable stereotypes – the Thief Lord reminded me of The Artful Dodger from Oliver Twist whilst Victor Getz, the detective, reminded me of Inspector Clusoe from The Pink Panther. However as the story progresses there are unexpected twists that bring the characters more depth and complexity as well as keeping the reader on the edge of their seat. The plot unfolds gradually and the climax and tension increase steadily throughout. However at no point does the story drag. There are enough twists to keep the reader gripped and wondering how the cobweb of inter-linked dramas will be resolved. And it is amazing how neatly the story does conclude even if an ounce of childlike imagination is required! So many children’s books are currently written as part of a series. Whilst there are obvious advantages to this (both commercial and also the great strength of drawing children into a particular world for longer), it was a refreshing change to read a story from beginning to end. I enjoyed the sense of completion that a stand-alone story has. 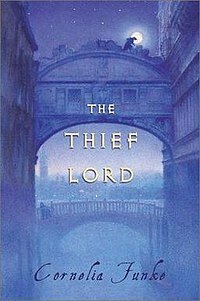 I would definitely recommend The Thief Lord to boy and girl readers aged nine years and older.